This post is an expanded version of a paper I’m formally giving at the Open Education Conference in Barcelona November 2-4, 2010. Since submitting the paper back in September there have been several new announcements related to Foundation support for OER that I’ve included here in the blog but are not in the original paper. The conference paper has a prescribed word count so the original abbreviated version of this paper will be published in the conference proceedings. This is a hybrid paper in that I’ve kept the APA style references of the original paper but also created links that allow for further exploration when read online. I plan to use this blog post to support the actual presentation at the Open Education Conference so I’ve added visuals for that purpose. I’m publishing it early with the aim of getting some feedback and suggestions that I can incorporate into the actual conference presentation. If you are planning on attending the conference I hope this sneak preview stimulates your interest and makes you want to attend my session. Attendees at the session are invited to use their laptop to follow along and explore the many links provided while I’m presenting. If you aren’t attending the conference let me know your thoughts by posting comments and I’ll incorporate them into the presentation. OER have now been in development and use since 2002. On the technology adoption lifecycle curve (Rogers, 1983) we’d say OER have come through the innovation phase, are striving for adoption, and aspire to cross into early majority. 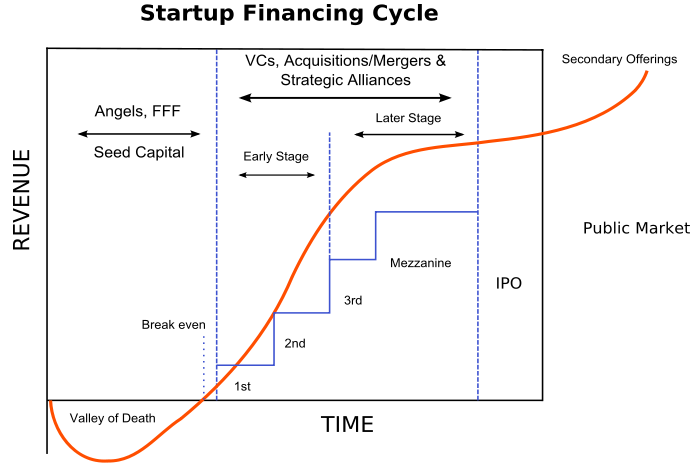 To the extent that OER are a disruptive innovation we can also consider Geoffrey Moore’s variation of this model that depicts a chasm between the early adoption and early majority phase. Many disruptive technology innovations do not successfully cross the chasm and simply disappear (Moore, 1991). Will this be the fate of OER? OER need sustainable business models and most importantly sustaining funding. One way to think about OER funding is to map it to a traditional start-up financing cycle of investment. The cycle of investment starts with seed funding provided by what the field refers to as friends, family and fools (FFF). Seed funding is usually a small amount required to kick start the effort. In the context of OER seed funding is the money put up by the institutions and organizations starting OER initiatives. As the development progresses a second round of funding is often sought in the form of angel investment. Angel investors typically invest their own capital to finance a ventures need. Angel investment is high risk. A large percentage of angel investments are lost completely when early stage ventures fail in the “valley of death”. Foundations have played the angel investment role for OER. Angel investment is high risk and short term. Angel capital fills the gap between friends and family and third stage funding where venture capital, banks, or initial public offering kick in. One strategy for sustaining OER developments as they transition from early innovation to mainstream is for government and tax-payer public funding to take over from the early stage funding foundations have provided. This paper examines some of the factors affecting the growth and sustainability of OER. It compares and contrasts foundation and government publicly funded OER initiatives in terms of global vs. local goals, licensing options, use cases, and outcomes. Emerging from this comparison are strategies and tactics that position OER for public funding, ongoing adoption, and a long-term sustainable future. The OER movement has been dominated by foundation funding. The Hewlett Foundation, the Mellon Foundation, the Ford Foundation, and more recently the Bill and Melinda Gates Foundation have been priming the OER pump with grants. These foundations each have distinct identities and philanthropic mandates that shape the programs and conditions by which OER funding is provided. Funding awards are not provided in a no-strings-attached fashion. Foundation grants are awarded to initiatives that support the goals of the foundation. If OER are going to transition to public funding its worth looking at foundation mandates and goals and thinking about the extent to which they match up with public funder mandates and goals. The Hewlett Foundation based in Menlo Park CA makes grants to solve social and environmental problems in the US and around the world. The Hewlett Foundation, along with the Mellon Foundation, was the first to support OER, has provided large grants on an ongoing basis, and continues to play an active role. Of all foundations Hewlett is by far the most influential and largest investor in the OER field. The Mellon Foundation’s role in open education has primarily been through awarding grants for initiatives that benefit teaching and learning through the collaborative development of open-source software. In the larger educational context that includes software such as uPortal, Kuali and Sakai. From an OER perspective Mellon’s focus has been on mass digitization of content in libraries and building archives and sharing content across institutions rather than supporting initiatives to develop open course content. But Mellon has partnered with other foundations to co-invest in large OER initiatives such as MIT’s OCW. 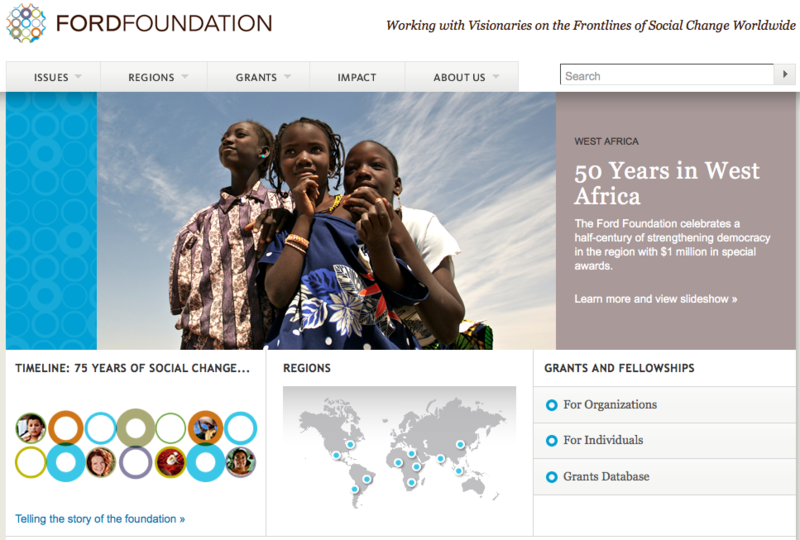 The Ford Foundation’s goals are to strengthen democratic values, reduce poverty and injustice, promote international cooperation, and advance human achievement. (Ford, 2010) The Ford Foundation has supported OER as part of the Partnership of Higher Education in Africa and IKSME’s OER ArtsCollab which is engaging teachers, learners, and practitioners in the collaborative development and use of OER in the arts and social justice. In Oct. 2009 Gates made a $5.3 million investment in the Washington State Student Completion Initiative. (Gates, 2010b) Of that total $1.8 million is going to the Washington State Board for Community & Technical Colleges for an Open Course Library initiative developing 81 high enrolment courses as OER. In Oct. 2010 the Gates Foundation announced plans to spend up to $20 million on the first phase of a Next Generation Learning program that could become as much as $80 million over the next four years. 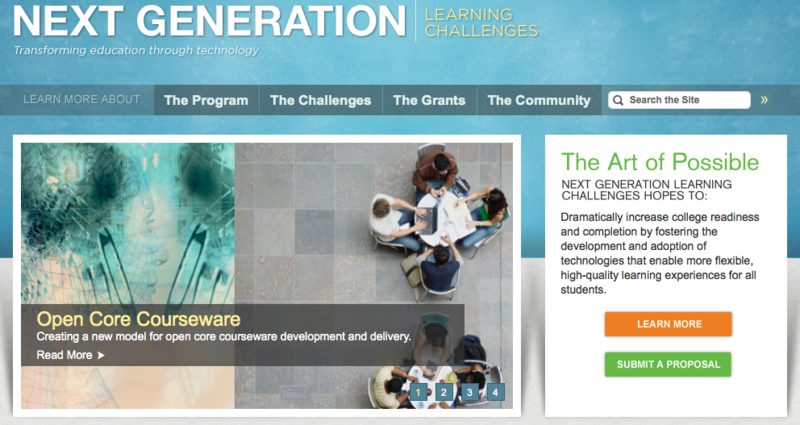 Open courseware is one of four areas being targeted for the first wave of grants. Open courseware for high-enrollment introductory classes like math, science, and English, which often have low rates of student success is of particular interest. In the OER context foundations like Hewlett, Mellon, Ford and Gates are angel investors supporting OER initiatives at a scale and with a volume of financing significantly beyond the start-up seed funding of OER initiators. 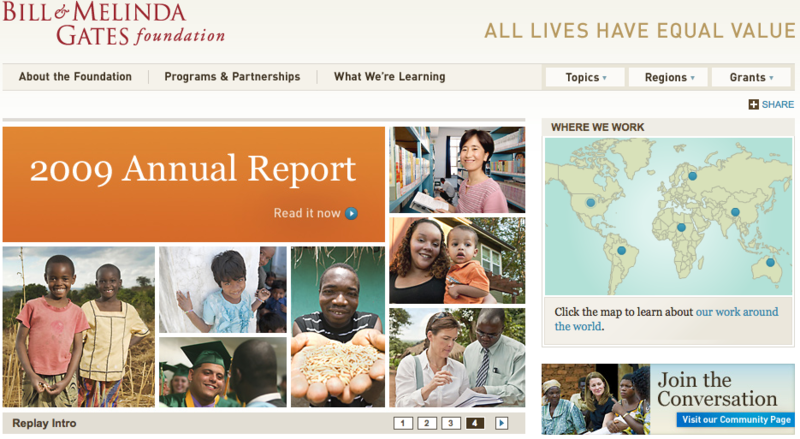 Most foundations have global and humanitarian mandates and goals. We’ve looked at the goals of foundations lets now look at specific foundation funded OER initiatives and see to what extent their goals match those of their funding foundation. to move away from solitary authoring, publishing, and learning process to one based on connecting people into global learning communities that share knowledge. A second major goal of the OLI is to provide access to high quality postsecondary courses (similar to those taught at Carnegie Mellon) to learners who cannot attend such institutions. (Thille, 2008 pp. 175) To support this OLI’s website provides free online courses and course materials that enact instruction for an entire course. Open Yale Courses provides free and open access to recorded lectures of a selection of introductory courses taught by faculty at Yale University. The aim of the project is to expand access to educational materials for all who wish to learn. Registration is not required and no course credit is available. Goals like “advance education around the world”, “publish courses as a public good” “connect people into global learning communities” and “expand access for all who wish to learn” align well with Foundation goals. But do they align well with government publicly funded education goals? For apples to apples comparative purposes the author has chosen initiatives focused on higher education open content as opposed to open educational practices, open source software, or other aspects of the field. Lets look at the goals of publicly funded OER initiatives. Funded through an annual Online Program Development Fund provided by the Ministry of Advanced Education the BCcampus OER goals are to increase credential opportunities available to students throughout the province by funding multi-institutional partnerships for the development of shared credit-based post-secondary online courses, programs, and resources. AEShareNet is a collaborative system in Australia established by the Australian Ministers of Education and Training to streamline the licensing of intellectual property so that Australian learning materials are developed, shared, and adapted efficiently. It plays an intermediary role between developers and users and in particular facilitates the transfer of educational resources between educational institutions. Its goal is to provide a process and online system that is streamlined, avoids duplication and increases efficiency. (OECD CERI, 2006 pp. 3-4) AEShareNet and other licensed educational resources are distributed through edna’s repository. The UK’s Joint Information Systems Committee (JISC) funded the JORUM initiative which put in place a repository for content UK higher education institutions wished to share. More recently JISC launched an OER content initiative to support the open release of existing learning resources for free use and repurposing worldwide. JISC OER will use JORUM as one of the vehicles for sharing. Goals like “increasing credential opportunities available to students throughout the province“, “establish school and college relationships” “develop courseware freely available to tertiary institutions in New Zealand” and “expand access to both open and closed digital learning resources” align well with government public funding goals. Government publicly funded OER have local goals that serve citizen education access and credential needs. One way OER goals are being achieved is through use of licenses. 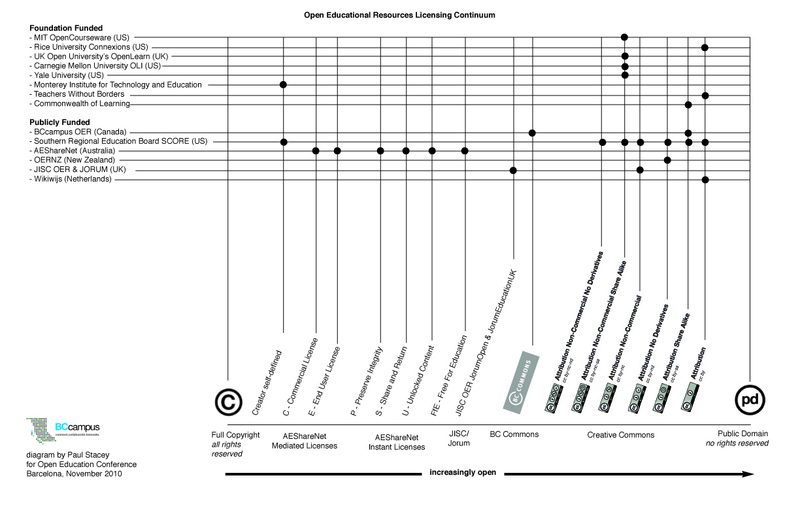 The diagram below shows an OER licensing continuum. At the far left of the continuum is full copyright all rights reserved. At the far right end of the continuum is public domain no rights reserved. 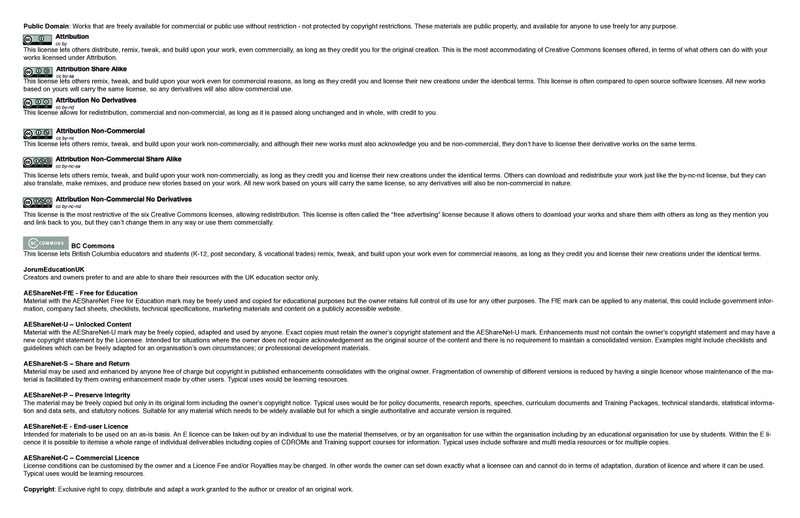 Licensing options are increasingly open as you move from left to right along the continuum. Foundation funded OER do not involve license options. Instead a single Creative Commons license is used with the majority of initiatives going with Attribution or Attribution Non-Commercial Share Alike. 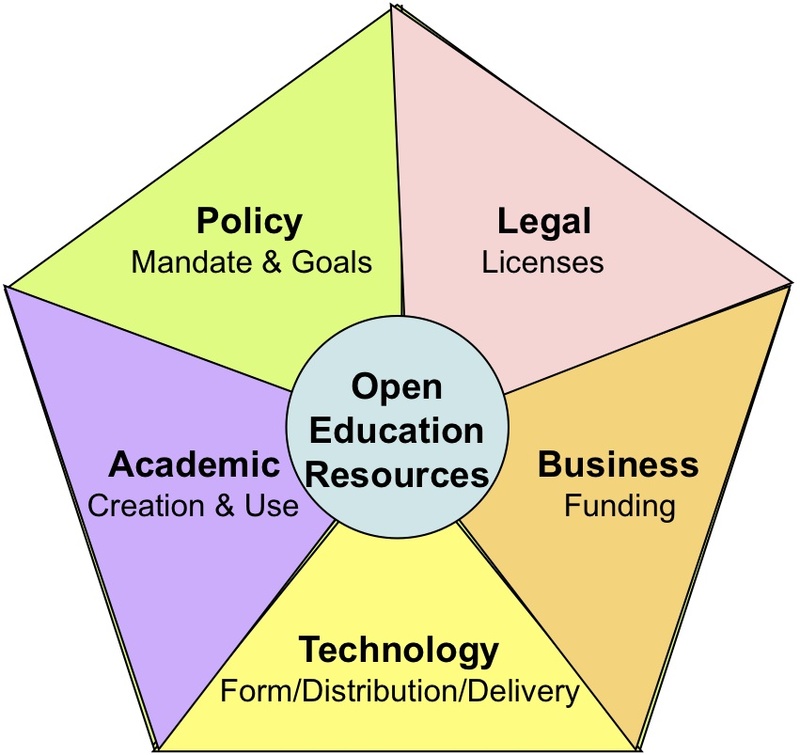 In contrast publicly funded OER often involve license options along an open continuum. The authors own BCcampus OER initiative gives developers of OER a choice between local sharing within the province of BC through a BC Commons license or global sharing using Creative Commons. JISC’s JORUM initiative has followed a similar path and Australia’s AEShareNet uses an even more refined approach. Recent publicly funded OER initiatives such as JISC’s OER and Netherlands Wikiwijs are being more explicit about dictating use of Creative Commons. But they still reference and acknowledge a need to support more closed resources. Lack of knowledge and fears around intellectual property, copyright infringement, quality and competitive advantage are still barriers to mainstream adoption and use of Creative Commons only. It’s interesting to note that no OER initiatives are fully open. None are placing resources directly into the public domain. Foundation funded OER are typically housed on a destination web site or use custom built software resulting in controlled access and use. Most resources are not optimized for online delivery independent of the OER site. Despite the OER license used by many of these initiatives downloads are often not editable or modifiable given their fixed file formats such as .pdf. Foundation funded OER initiatives are often more oriented to informal non-credit learning for students than to teachers. MIT is explicit in stating OCW, is not an MIT education, does not grant degrees or certificates, and does not provide access to MIT faculty. Initiatives like Carnegie Mellon’s OLI require instructors to ask permission for an account and even then use of the OLI OER must be done through Carnegie Mellon’s OLI technology rather than the instructor’s own institutions applications. As part of its sustainability strategy Carnegie Mellon’s OLI use by instructors even has fees. The primary use case of publicly funded OER is for formal credit-based academic offerings rather than informal study by students. Publicly funded OER are often a form of curriculum development providing faculty with resources to use in their courses or in development of new for-credit offerings. Publicly funded OER are typically housed in a repository which provides an access and distribution role but not usually a creation or course delivery role. OER are uploaded, searched for, and previewed on the repository but usually downloaded for use independent of the repository through an institutions own learning management system or other educational technology. Comparing and contrasting foundation with government publicly funded OER initiatives reveals commonalities, differences, and a diversity of approaches. This framework can be used to define and refine strategy and tactics associated with any OER initiative. It can also be used as a basis for comparing and contrasting OER initiatives. 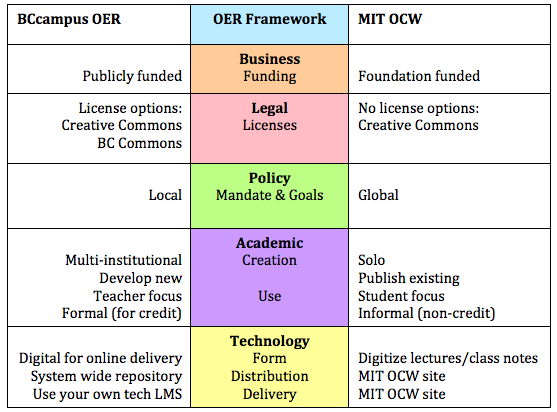 As an example the following table highlights differences between the BCcampus OER initiative and MIT’s OCW initiative. As shown in this table the publicly funded BCcampus OER initiative has focused on developing new online learning resources through system partnerships and collaboration. The content produced is primarily intended for faculty use in formal for-credit education offerings delivered via their institutions learning management system. The primary mandate for open sharing within the jurisdiction of the public funder is enabled through a BC Commons open license and global participation supported as a choice of the developer through a Creative Commons license. In contrast the foundation funded MIT OCW OER initiative has focused on publishing a single prestigious institution’s existing lectures, course notes, and learning activities associated with campus-based classroom activity. These resources are freely provided as a public good for use primarily in informal non-credit learning. The foundation funded OER meets global philanthropic goals by mandating a single Creative Commons license but requires users to access the OER through MIT’s technologies. Opening Up Education: The Collective Advancement of Education through Open Technology, Open Content, and Open Knowledge, pp. 232. Cambridge, MA: MIT Press. Downes, S. (2007). Models for Sustainable Open Educational Resources. Interdisciplinary Journal of Knowledge and Learning Objects. Volume 3, pp. 29-44. Lane, A. (2008). Reflections on sustaining Open Educational Resources: an institutional case study. Retrieved August 31, 2010 from http://www.elearningeuropa.info/files/media/media16677.pdf. Opening Up Education: The Collective Advancement of Education through Open Technology, Open Content, and Open Knowledge pp. 149–164. Cambridge, MA: MIT Press. Opening Up Education: The Collective Advancement of Education through Open Technology, Open Content, and Open Knowledge, pp. 213-227. Cambridge, MA: MIT Press. Moore, Geoffrey A. (1991). Crossing the Chasm. New York: HarperCollins Publishers. New Zealand OER (2010). New Zealand Open Educational Resources Project. Retrieved August 31, 2010 from http://www.repository.ac.nz/. Rogers, Everett M. (1983). Diffusion of Innovations. New York: Free Press. Stacey, P., R. Rominger (2006). A Dialogue on Open Educational Resources and Social Authoring Models. In Open Education 2006 Conference Proceedings pp. 107-115, Utah State University.